The very idea of mushrooms as medicine may surprise many of you, but they bring a perfect blend of tradition and science to our medicine cabinets. Mushrooms are some of humankind’s oldest and most highly prized remedies with recorded use dating back thousands of years. And while many of us may think of mushrooms as powerful immune system activators, their benefits go way beyond, including possible applications with Alzheimer’s, diabetes, stress, cardiovascular disease, aging and cancer. Mushrooms have antioxidant, anti-inflammatory, immunity enhancing, anti-viral and anti-tumor effects. Researchers have found that consuming just 3-5 servings of mushrooms per week reduced risk of breast cancer by 64% and when combined with regular consumption of green tea, affords up to a 90% reduction in risk. (A serving is about 1/8 of a cup/ 10 grams.) Some mushrooms can be enjoyed as food, while others are best used in supplemental form. A note on supplements: In most cases, it is best to take them in between meals to increase absorption rather than dilute with food. Meshima mushrooms are cancer-preventive, support DNA, WBC’s and the immune system, encourage apoptosis (cell death) inhibit angiogenesis (spread), and effect metastasis on many levels. 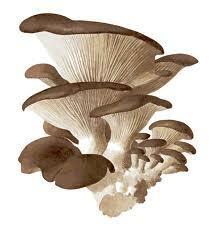 Meshima mushrooms also enhance the efficacy of chemotherapy and help lessen the side effects. Meshima has great synergy with broccoli and green tea, so enjoy them together! Maitake contains a substance called beta-glucan which may stimulate the immune system and activate certain cells (T cells, natural killer cells, etc.) and proteins that attack cancer and therefore may limit or reverse tumor growth (induces apoptosis). Reishi offers great immune support as well as protection against radiation. Reishi also improves liver health—critical for all, but certainly for cancer patients. With Reishi, the longer you take it, the greater the benefit. Chaga has many cancer benefits (look for birch tree grown and must be hot water extracted.) Chaga offers protection from radiation, reduces inflammation, protects DNA and gives strength to the body– it enables the body to more efficiently deal with the toxins we are exposed to on a daily basis (environmental and from treatments such as chemotherapy). It is important to note that with some mushrooms, more is better, but this is not the case with Chaga….take only as directed on the package. Shitake mushrooms stimulate the immune system, activate killer cells, and slow or even halt tumor growth. But what about the lonely button mushrooms? Don’t keep them lonely, eat them. Button mushrooms are thought to contain natural aromatase inhibitors, substances that can block the production of estrogen in the body. Controlling aromatase activity can help decrease estrogen levels, which controls and kills hormone-dependent breast cancers. A word of caution on mushrooms: Eaten raw, mushrooms contain compounds, called hydrazines, which may be carcinogenic. Hydrazines are destroyed by cooking, drying or canning. Also, the mycochitin composition of mushroom cell walls, as opposed to cellulose walls of plant cells, is difficult for humans to digest. Our stomachs resent indigestible items, and often forcibly reject them without absorbing nutrients. The cooking process helps break down fungal cell walls, rendering mushroom flesh not only more readily digestible, but also releasing significant nutritional value contained within the cells. My advice? Consume a variety of fresh mushrooms and supplements as part of an anti-cancer diet and lifestyle to employ maximum anti-cancer benefits. Eaten daily or at least several times a week in conjunction with green tea, mushrooms may help put you in that impressive risk reduction category. Want to read more mushroom wisdom? Elyn Jacobs is a breast cancer survivor, professional cancer coach, radio talk show host, speaker, and the Executive Director for the Emerald Heart Cancer Foundation. She is also on the peer review board of the Natural Standard Database. Elyn empowers women to choose the path for treatment that best fits their own individual needs. She mentors women who are coping with issues of well-being associated with breast cancer and its aftermath; she is passionate about helping others move forward into a life of health and wellbeing. Elyn has been featured on CNN Money, Talk About Health and more and has contributed to Breast Cancer Answers as well as written for the Pink Paper, Breast Cancer Wellness, Natural Healing-Natural Wellness, Integrative Oncology Essentials, and other publications and newsletters. Elyn lives in New York with her husband and two young boys.